The range of physical phenomena that scientists are trying to "cloak" objects from has a new entry - heat. French researchers have shown how to apply the ideas of "optical cloaking" - the endeavour to make a Harry Potter-style cloak - to the thermal world. The applications for the idea,outlined in Optics Express, stretch beyond hiding from thermal-imaging devices. It could also be used to direct and move heat around in temperature-sensitive electronics. There has been a tremendous amount of research into what is called transformation optics since it wasfirst proposed as a means to an invisibility cloakin 2006. So far, all of the cloaking approaches have limitations that keep them well short of the invisibility promised in fiction. But more recently, similar ideas have been put to use toshield objects from magnetic fieldsor evenfrom soundorseismic waves. All of these approaches aim to manipulate the peaks and troughs of waves to achieve their cloaking effects. But as Sebastien Guenneau of the Institut Fresnel in France explained, the transfer of heat is a subtly different business. "Heat isn't a wave - it simply diffuses from hot to cold regions," he said. "The mathematics and physics at play are much different. For instance, a wave can travel long distances with little attenuation, whereas temperature usually diffuses over smaller distances." 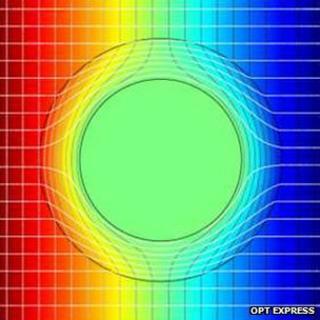 The trick was to apply the mathematics of transformation optics to the equations describing diffusion; the result, Dr Guenneau and his colleagues found, was a means to shuttle heat around at will. The approach is fundamentally different from temperature-changing cloaks that heat and cool actively to mimic objects of different temperatures andhave proven to "hide" a tank. In the new technique, the researchers propose a cloak made of 20 rings of material, each with its own "diffusivity" - the degree to which it can transmit and dissipate heat. "We can design a cloak so that heat diffuses around an invisibility region, which is then protected from heat," Dr Guenneau explained. "Or we can force heat to concentrate in a small volume, which will then heat up very rapidly." It is this ability to direct and concentrate heat that may find first application, for instance in the microelectronics industry, where the heat load in specific areas remains a difficult challenge to engineers.